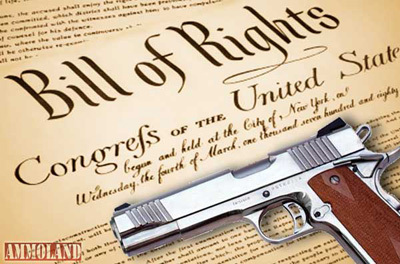 If you watch enough news, if you listen to enough talk-radio, if you even read mainstream press, you might think that the only part of the Bill of Rights that matters is the Second Amendment. Strong supporters of the Second Amendment fervently state that the right to bear arms is sacrosanct. But what about other rights guaranteed in the first ten amendments? How do they stack up in relation to gun rights? First we have to establish a basic principle that many 2nd-ers have difficulty accepting. No rights are absolute. The laws of logic and physics clearly demonstrate that that when two objects with “free range” come in contact with one another, something has to give. The right of someone to drive his or her car wherever he or she wishes will come in conflict with the right of the store owner to not have his business demolished by a speeding car. We need rules to control that. Similarly, the right of a consumer to purchase a cake from any bakery comes in conflict with the baker’s right to refuse to sell to whomever he or she wants. Figuring this out requires legislation, and in 1964 Congress passed a civil rights act that guaranteed consumers the right to shop where they wish. No longer could restaurants, hotels, five and dime stores in the South refuse to serve someone because of the color of his or her skin. That quickly became established laws, although recently, in some locales such as Mike Pence’s Indiana, efforts have been made to allow discrimination under the guise of religious freedom. Back to guns. It’s interesting that nearly eighty percent of Americans do not own guns. So twenty percent of Americans might have the practicality of their gun rights being infringed when gun control measures are taken. But compare this to other rights delineated in the Bill. Percent of Americans upon whom restriction could impact. First Freedom of press 99% Virtually everyone goes on the internet, watches TV, reads papers, if only for the ads. First Freedom to peacefully assemble. 99% People go to movies, to sporting events, even to political rallies. Fourth Freedom against unreasonable searches 100% Everyone’s privacy can be invaded. Eighth Freedom from cruel or unusual punishment. Less than 10% Not all of us are charged with criminal offenses. When a government is suppressing rights (think Russia or Turkey now), the first rights to go are those of speech, the press and peaceful assembly. When crackdowns on the rights occur, they impact all citizens. Whether you own a gun or not, you will be impact when the government restricts without reason what you can say, what you can write, and where you can go. And no matter how many guns you have, you will not be a match for government forces. For most of us, there would be virtually no changes in our lives (except increased safety) if gun rights were restricted. But virtually all of us would feel even the slightest impact from restrictions on those rights guaranteed in the First Amendment. I might be more inclined to listen more carefully to the arguments of Second Amendment proponents if (1) I felt that they valued some of the other rights outlined in the Bill of Rights, and (2) if they seemed to understand that no rights are absolute; they all involve trade-offs. Previous Post:Muslim women say: “Trump, can you hear us now?